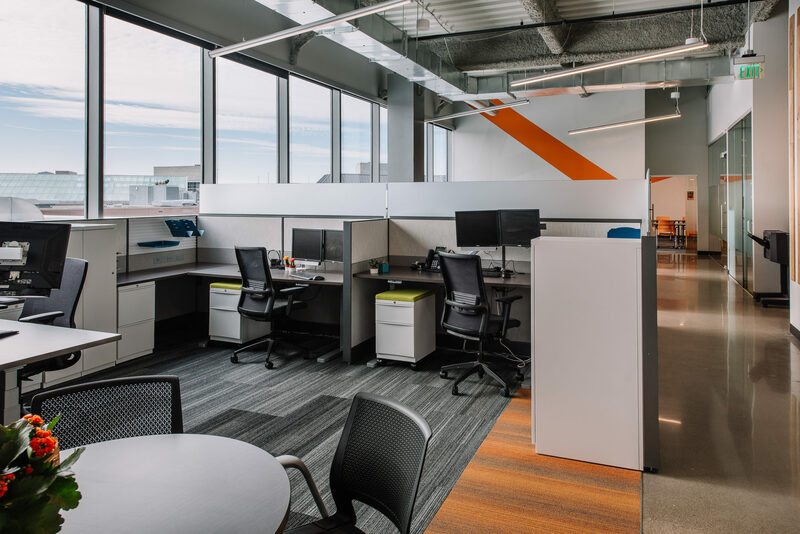 May 8th, 2018 – Bloomington, Minn. – After 25 years of working in the basement of Mall of America, the executives moved into new offices located in the mall office tower, Offices @ MOA, built in 2015. With the help of KOMA and a well-developed design team, the move is complete and the staff is now working from a bright, airy and energetic space. The existing offices were dark, lacking natural light and were a maze of corridors and cubicles. 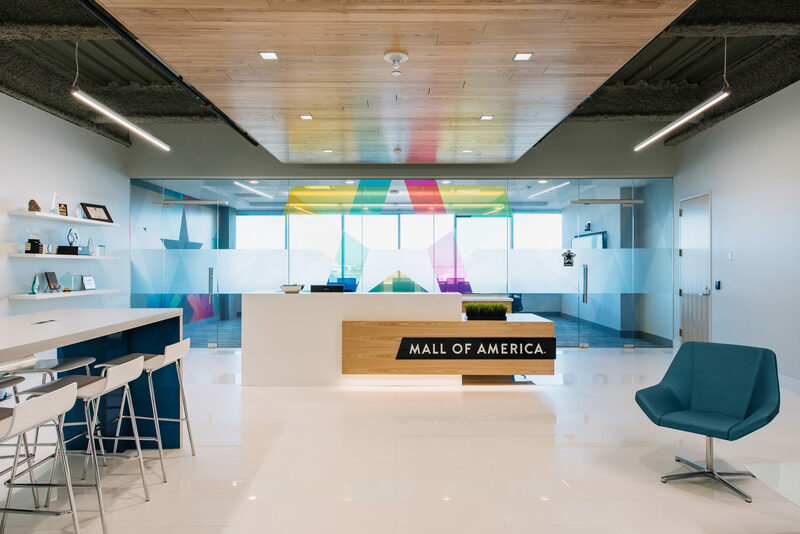 In 2015 when the owners of Mall of America built the Offices @ MOA, the executives saw an opportunity to relocate not only their executive offices but also the operational and construction offices. The goal was to create an environment that reflected the brand and encouraged a collaborative culture. Building on groundwork created by Cunningham Group and Toronto based GH+A, KOMA developed a comprehensive design that reflected these needs. The lobby is a crisp white space anchored by a sleek reception desk which is backed by a translucent MOA logo on a glass partition. The MOA logo and signature ribbon runs throughout the space. The brand is further visible through means of color and pattern in carpet and wall graphics. Capitalizing on an open, clean, new space, an intentional design approach for the office was taken – leaving exposed ceiling decks and polished concrete floors in circulation areas. LED light strips installed at an angle create visual interest and movement in the open space. 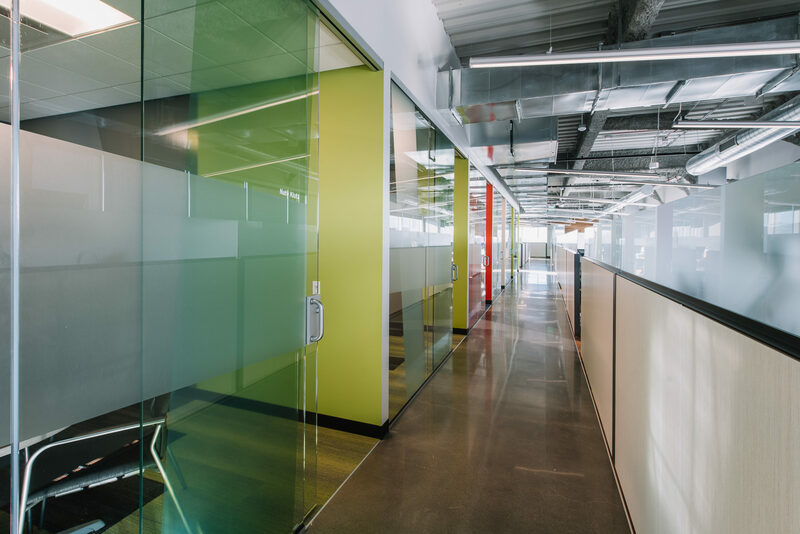 Low paneled workstations and color blocking on groupings of offices create neighborhoods and promote ease of way-finding. Full height glass on interior spaces allows the natural light to permeate throughout the space.